« Between two worlds » is the title of his new album, recorded under the aegis of Bruno Mylonas (who had produced Vanessa Paradis and Aldebert, among others), of Erick Benzi (Yannick Noah, Jean-Jacques Goldman) and of Laurent Guéneau (Sinsémilia, Souad Massi). 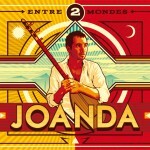 Here, Joanda and his band offer us an album where contemporary guitar sounds intermingle with traditional Occitan and mediterranean instruments, like a journey to the heart of southern France. In these 14 songs, the soul of Occitania is revealed to the world, where the beat of the ‘cajon’, the languedoc bagpipe, the hurdy-gurdy, the luth, guitars and drums, the haunting tune of the piano or the enchanting ballad of the violin magically come together. Sometimes played with the haunting charm of an ageless land, at other times dancing with a modernity accessible to everyone, the instruments sing with the virtuosity only Joanda can produce. In both French and Occitan, the singer-songwriter’s voice and style can be at times moving, as in the song Te-tu souviens de nous ? (do you remember us? ), cutting as in Enfant de Paratge (child of sharing), jubilant as in Gosta la vida! (taste life!) or light-hearted as in Le pont qui danse (the dancing bridge). With lyrics at the same time unique and universal, the songs of this latest album are imbued with the spirit of a land and a people, they soothe our ears, always seeking new sounds.